Maintaining proper humidity in Buster's crabitat is vital. He uses modified gills to breathe that have to remain moist at all times to avoid suffocation. The ideal humidity level for a crabitat is between 70 and 80 percent. Sponges are one way to provide a humid living space for Buster. Sponges can be a cost-effective way to provide Buster a home where he can rest and breathe easy. Advocates consider sea sponges a very effective way to disperse humidity into the air. If you want to use sponges, however, you'll have to stay on top of keeping them moist and clean. And don't use kitchen sponges; stick to sea or natural sponges for Buster's house. If you use sponges to humidify Buster's home, have several on hand to switch out regularly. Every three or four days you should change the sponge in the crabitat, as it can collect and breed unhealthy bacteria. When you replace a sponge, thoroughly rinse the old one in hot water and give it a soak in a sea-salt solution. After rinsing it with dechlorinated water, squeeze as much out as you can and allow the sponge to air dry. If you want to be sure it's properly disinfected, put the completely dry sponge in the microwave for two minutes. A moist sponge in the microwave can shrink to nothing. 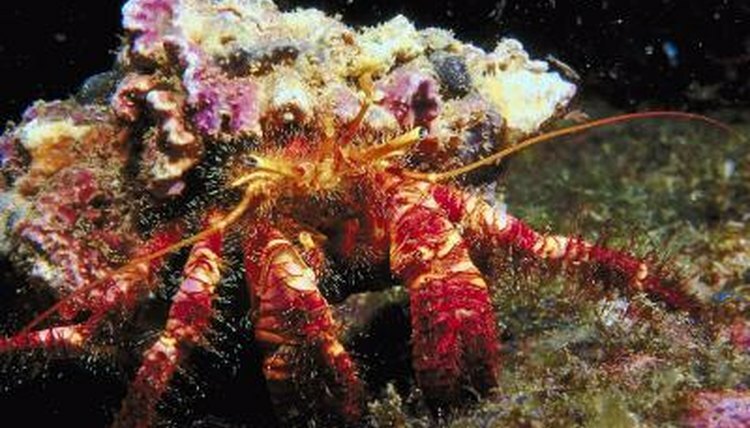 Not all hermit crab enthusiasts endorse sponges, which must be properly maintained to be safe and effective. And despite what some think, they aren't necessary to provide drinking water. Buster will do fine drinking from his water dish. Moss is a good alternative to sponges, and Hermit Crab Paradise recommends using hiawatha or sphagnum moss that's free of pesticides and green dyes. Moss doesn't have to be changed or sterilized and can be embedded in Buster's bedding or attached to the side of the crabitat with suction cups. Fill a plastic or glass container with the moss, wet it with saltwater and keep it moist with fresh or diluted saltwater. The key is to keep it moist, but not dripping wet. If you're not keen on cleaning sponges regularly, worried about bacteria or can't get your hands on the right kind of moss, there are other options. Maintaining areas of water throughout the crabitat will provide humidity, or you can use your finger to burrow holes in the corners of the tank and keep them filled with water. If you can afford it, you can buy a humidifier specifically for your crabitat. If you can't afford a humidifier, do not skimp and neglect to buy a humidity gauge. Gauges are available online and are a small investment to help ensure Buster's good health. How Much Substrate for Hermit Crabs in a 10-Gallon Aquarium? What Kind of Sand Do You Use for Hermit Crabs? Does a Hermit Crab Have Lungs or Gills? Can a Hermit Crab Breathe in Dirt? Do I Need a Filter for Aquatic Frogs? How Does a Hermit Crab Drink?